I thoroughly enjoyed watching "The Hobbit: An Unexpected Journey" over the weekend. Yes, as many of the critical reviews note - it was silly at times but hey - so was the book, so it worked for me. Of course the film was chock-full of awesome New Zealand moss and I was ready to share a still from the film for today's moss monday. 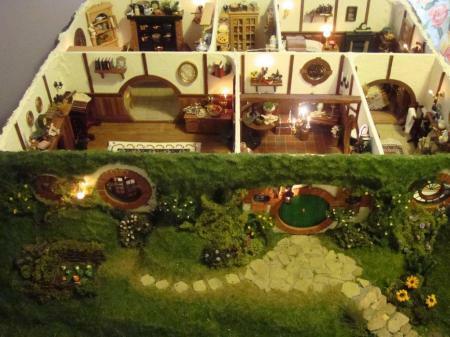 And then I happened upon the most wonderful handmade Bag End dollhouse ever. I'm sharing one more photo below but if these look remotely interesting to you then check out Maddie Chambers/Brindley's blog madshobbithole and see her entire photo set. 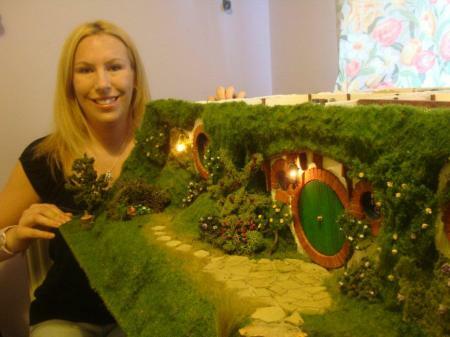 The level of detail is astounding. Faux terrarium it's not but it is full of fake moss and it is awesome.